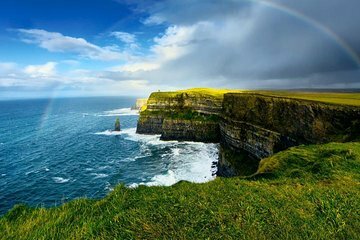 See for yourself what makes the Cliffs of Moher Ireland’s top natural attraction on a private, full-day tour from Cork. These spectacular, emerald sea cliffs tower 700 feet (214 meters) above the Atlantic seaboard, making for unforgettable views and photographs. On the way to the coast, hear local legends and history from your private guide as you pass through towns like Limerick, Kilfenora and Doolin and visit the majestic Bunratty Castle. Enjoy far more flexibility than you would on a group tour during this private and personalized option. Our guide was fantastic, warm, friendly and extremely knowledgeable. It was just my husband and I and our guide for the day. He picked us up at our hotel. The only hitches in the day were that he didn't know it was just the two of us and he had a small bus that would be for a group. Also, he picked us up an hour earlier than the advertised time. We hadn't had breakfast yet, but he told us to go ahead and take advantage of the hotel breakfast and just come to the bus when we were ready. It is a long drive to the cliffs from Cork, but if you're not going to have any other opportunity to see this part of Ireland, it's well worth the money. The stop in Limerick is brief, but it gives you more time to explore the cliffs, which we were on our own for - the guide stayed back at the visitor's center and met us on the bus after our allotted time there. Just being the two of us with the guide gave us a lot of flexibility, the guide's only concern was the weather at the cliffs and getting there before it turned too bad. He knew what he was talking about, storms were coming but we made it in plenty of time before they came and had a great visit there. It's beautiful, breathtaking, and a only bit nerve-wracking. There are no fences or barriers and when you go beyond the paved path, the foot path can come close to the edge in places. But there is an upper path further away from the edge that we stayed on. Beautiful tour and excellent guide, one of the most awesome places to visit .